Dr. Craig Yoder is a native of Middlebury, Indiana and a lifelong resident of the area. Dr. Yoder received his Bachelor of Arts degree in Biology from Wabash College in 1982 and his Doctorate of Dental Surgery degree in 1986 from Indiana University School of Dentistry. He maintains memberships in the American Dental Association, Indiana Dental Association, Chicago Dental Society, North Central Indiana Dental Society, and the Elkhart County Dental Society. He established his general dental practice in 1986 in downtown Middlebury. He built his current office and moved to the Bristol Avenue address in 1996. Dr. Yoder is experienced in all areas of general dentistry. He has additional training in rotary endodontics (root canal treatment), laser diagnostic and laser treatment procedures, implant restorations, and sleep apnea and snoring appliances. He and his staff are committed to providing complete and comprehensive dental care for all ages of patients. When he’s not in his office, Dr. Yoder enjoys spending time with his family which includes his wife, Catherine, and their four sons. He also enjoys golf and reading. Active in the Middlebury community, Dr. Yoder is involved in the Crystal Valley Exchange Club, Middlebury 4-H Club, Northridge Dollars for Scholars, Band Boosters, and Choral Music Parents, and Brenneman Memorial Missionary Church. 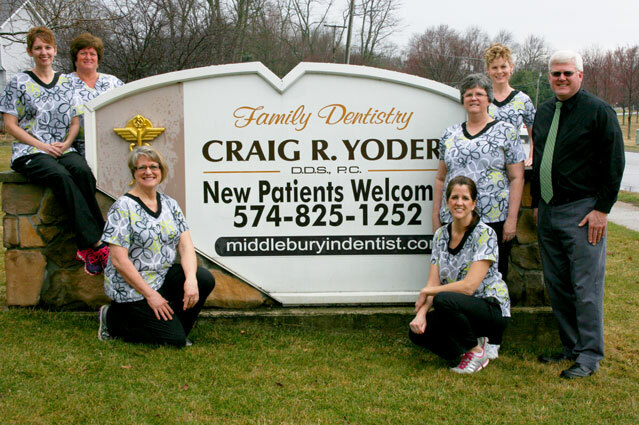 Dr. Yoder employs three registered dental hygienists, three multi-function persons involved as treatment coordinators/chair side dental assistants/receptionists and one accounting bookkeeper. He has five fully equipped treatment rooms which are all computerized and networked together with the front office allowing seamless coordination in caring for all our patients needs. We maintain a close working relationship with all dental specialty professionals in the areas of endodontics, oral surgery, periodontics, pediatric dentistry, and orthodontics. ©2015 Craig R. Yoder DDS, PC. All Rights Reserved.